No matter where you are from, we can safely say chocolate is arguably one of the most popular sweets. However, usually binging on chocolate comes with its own setbacks—a hefty amount of fat (thanks to the cocoa butter needed to thin the chocolate for production) and a side order of guilt. Now, thanks to electrical engineers and a new technique, you don’t need to hold back your chocolate cravings anymore. Current chocolate manufacturing techniques are the main reason chocolate has such a high fat content (as much as 40% to 60%). The the main ingredients’ (cocoa powder, cocoa butter, and sugar) are required to be melt down to flow through the tubes during the manufacturing process and it’s the fat in the cocoa butter which helps to reduce the thickness. 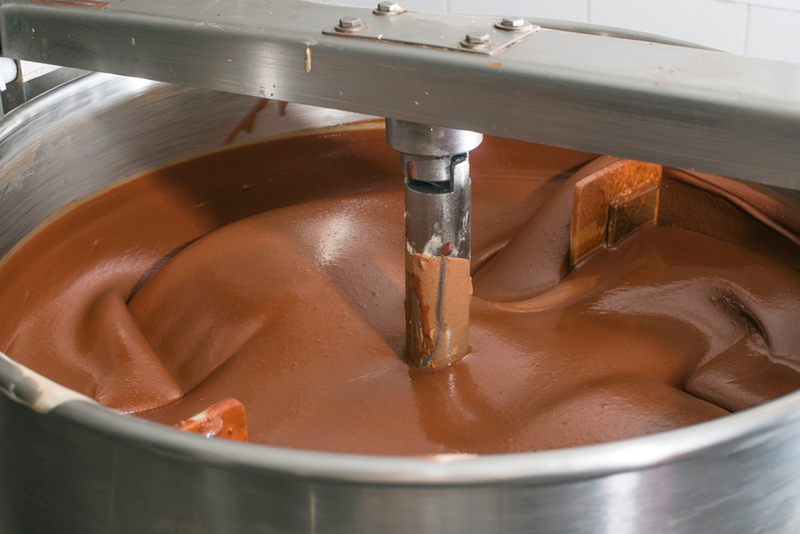 Without enough cocoa butter, the chocolate could block the factory pipes, leading to amounts higher than approximately 36% fat or more in order to create the viscosity needed to flow properly. Physicists at Temple University in Philadelphia have come up with an innovative approach to manufacturing chocolate—allowing for lower fat content—by applying an electric field in the flow direction of a liquid stream of chocolate. This method, known as electrorheology (ER), can lower the fat levels in chocolate by up to 20%, while simultaneously improving the flow. ER is the concept of passing an electric field into a substance to increase in viscosity. Researchers discovered when this technique was applied to chocolate, the viscosity was significantly enhanced—ensuring a lower calorie count. The study, published in the Proceedings of the National Academy of Sciences Journal, will provide chocolate lovers with the hope of healthier chocolate without sacrificing its sugar count and delicious taste. The study is already supported by two patents from the United States Patent and Trademark Office and funding from Mars Chocolate. It won’t be long until, according to study authors, “a new class of healthier and tastier chocolate,” is available for all. So on this National Chocolate Day, thank an engineer for helping solve the chocolate viscosity problem and creating an opportunity for healthy chocolate by applying some astute electrical engineering concepts.